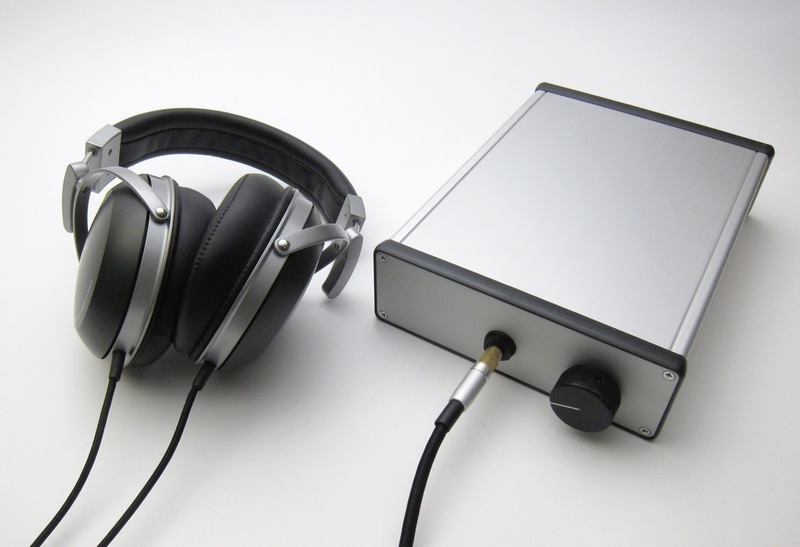 This one will drive any headphone you want to throw at it. Wayne wanted a headphone amp for his desk. This is the fruits of that idea. It’s made to be made in an afternoon or an evening and it has no adjustments, it’s going to have a high likleyhood of success for the builders. 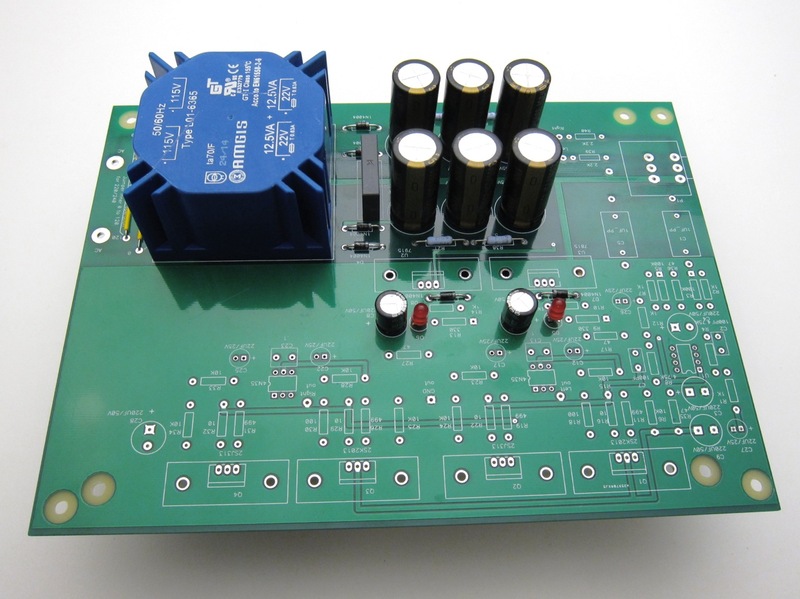 Class-A output stage with enough current to drive anything. It also makes a good linestage with about 14db of gain. 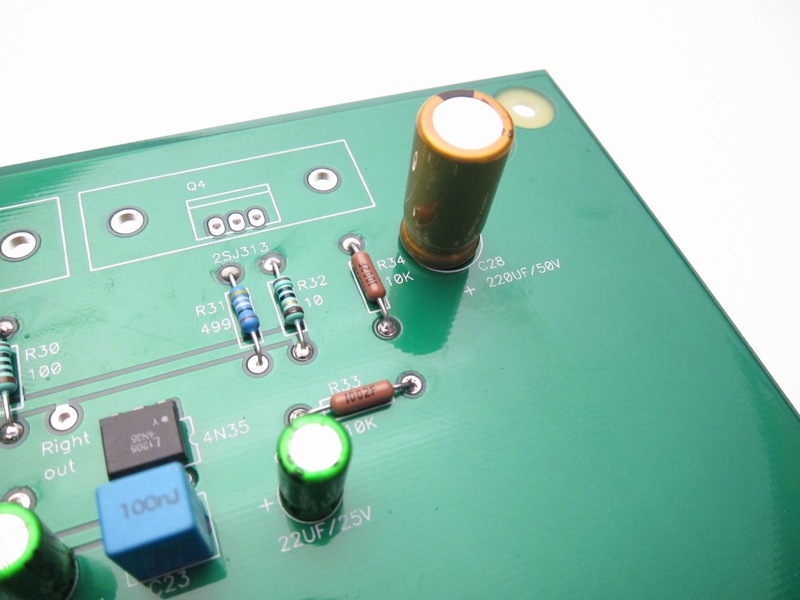 25VA 22V+22V is best and used in this guide. 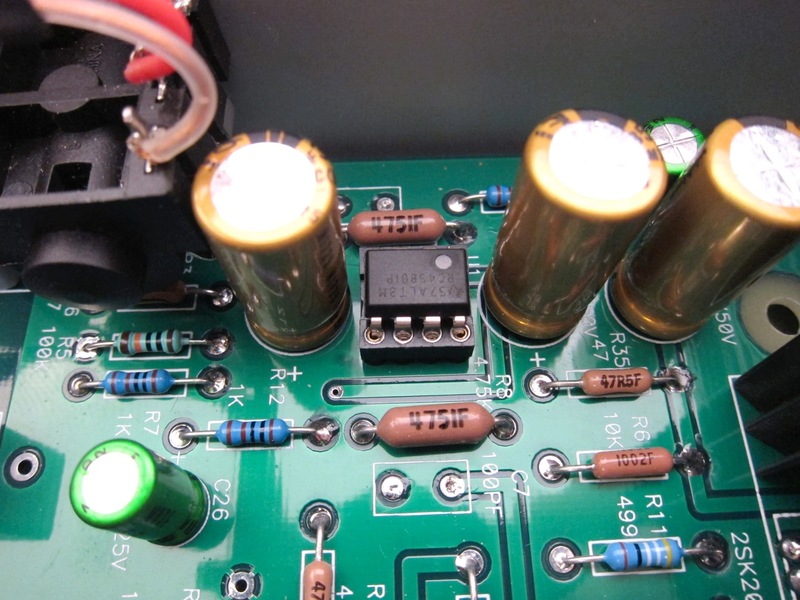 Here's a link to a factory surplus transformer that fit the PCB will work beautifully - You will want to make R16, R22, R29, R32 15ohm if using this transformer. 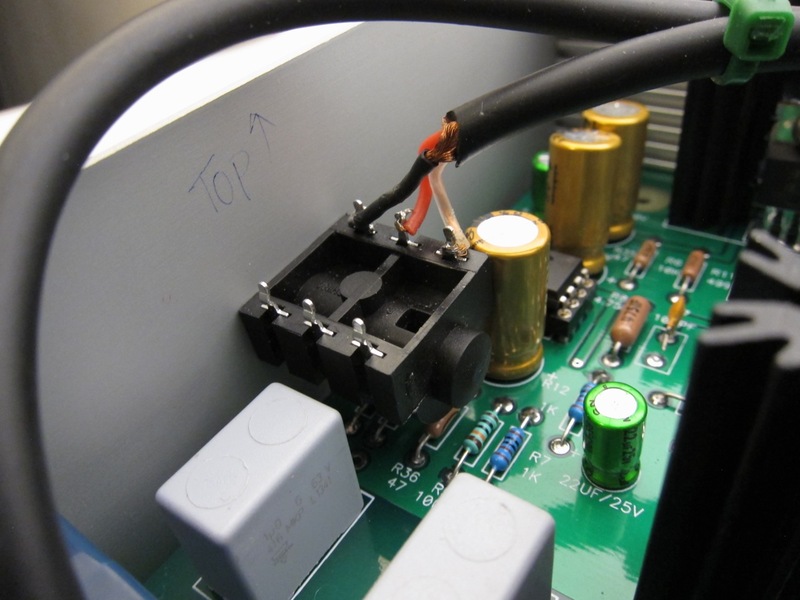 If you use smaller transformer you may need to adjust the bias down a bit. It will still be pure class-A for 99.999999999% of all headphone listening. 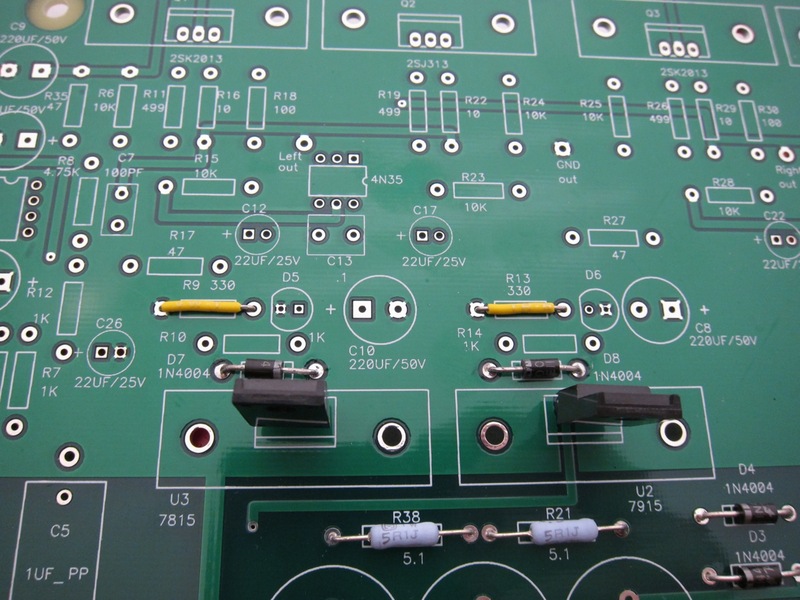 The bridge is made from 1N4004 or use high speed diode if you like. Snubber capacitor C20 0.22uF 250v X-rated. 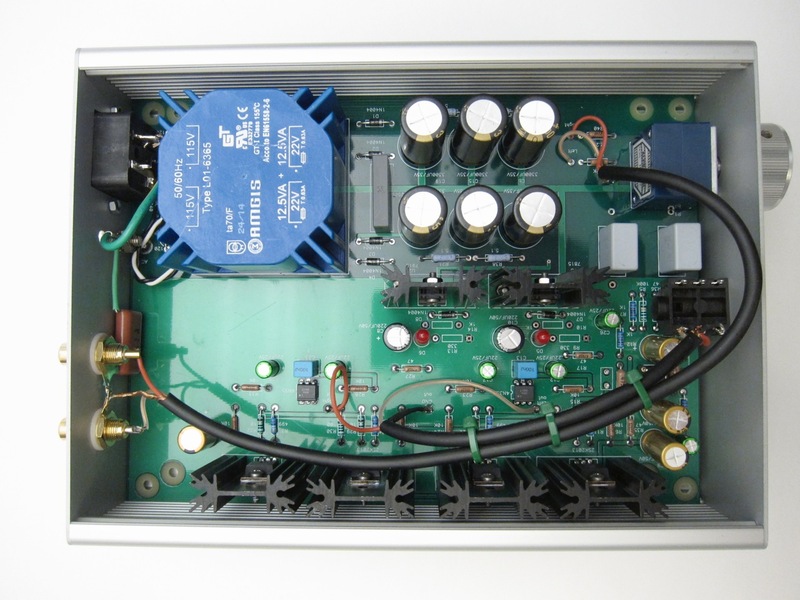 AC filtering is done in a big and effective way, utilizing a CRCRC filter with 3300uF capacitors and 5.1ohm resistors. You can use smaller resistors and caps if you like, it's a very effective filter and will work well with even 1/2 the values. The regulators using 7815/7915 can be elevated a bit, using a red or green LED as the reference if you wish. Don’t use blue, they are noisy and they will set the regulators to too high of a voltage. 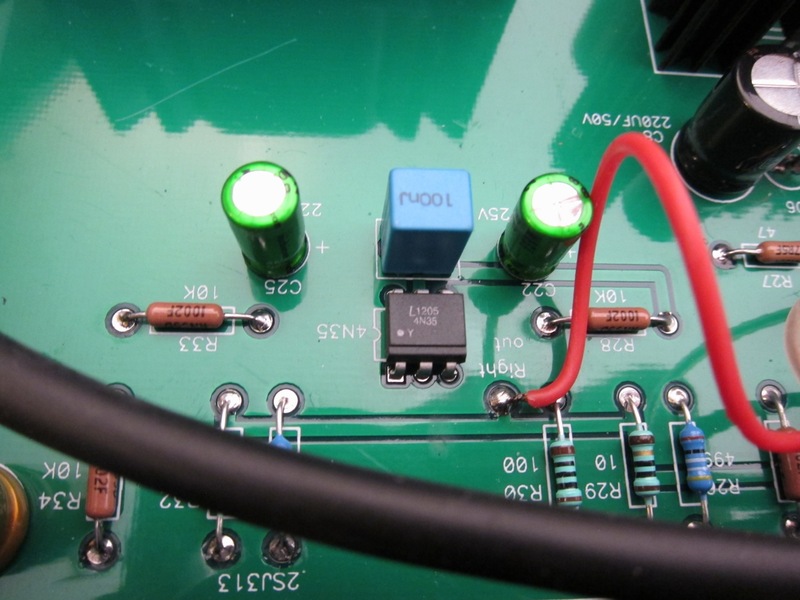 On the input there is a dual opamp used for voltage gain. 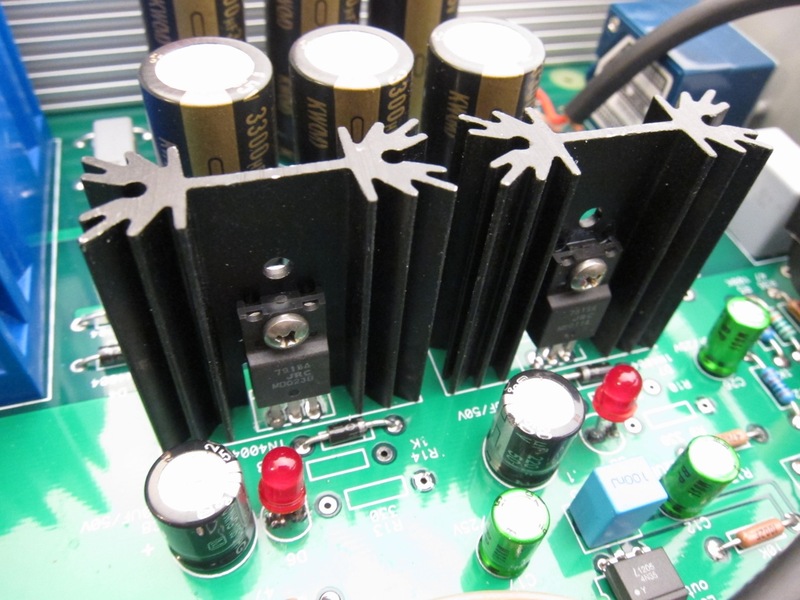 We’ve tried these with great success LM833, Muses 8820, RC4580, OPA2604, AD823, TL072. 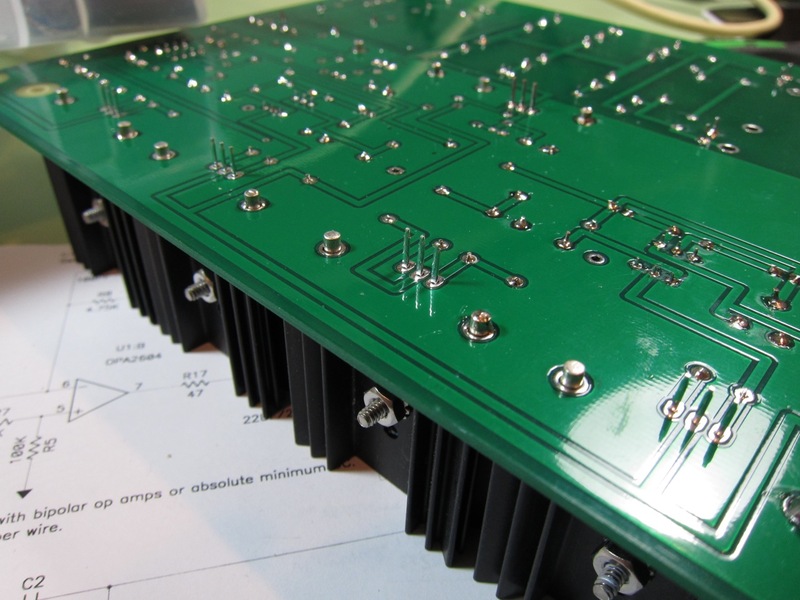 If you want to try a different opamp, try something made for audio. 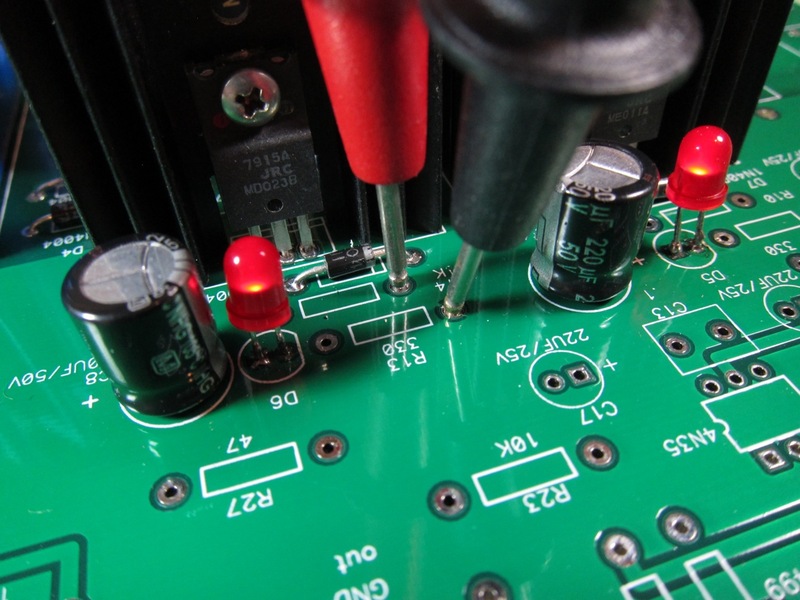 Feel free to try some surface-mount opamps in a DIP adaptor if you like, there are lots of neat opamps to try. 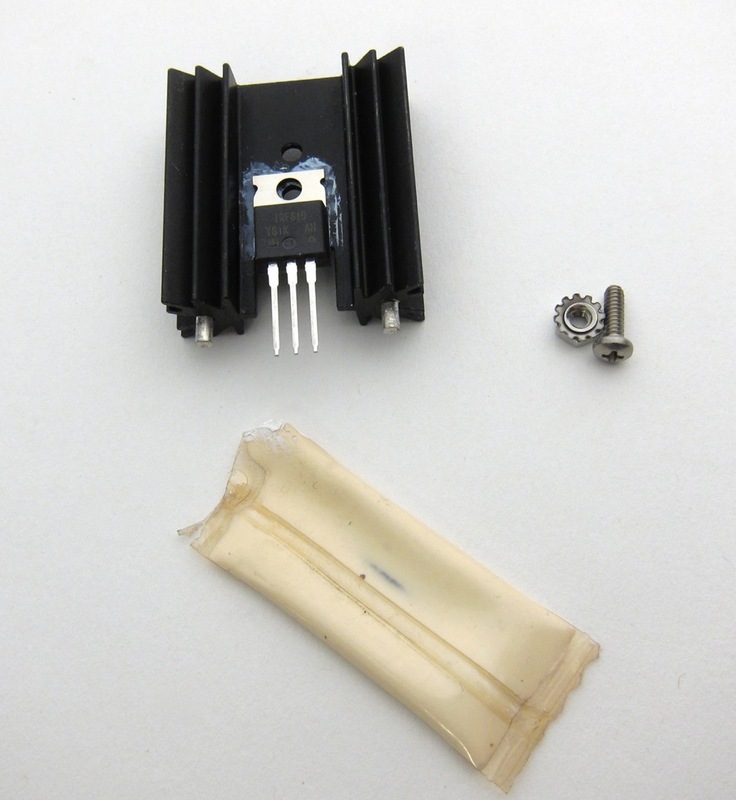 Potentiometer - Alps RK27 fits the PCB, feel free to use what you like. If you have room in your chassis, this is a fine place for a stepped attenuator. 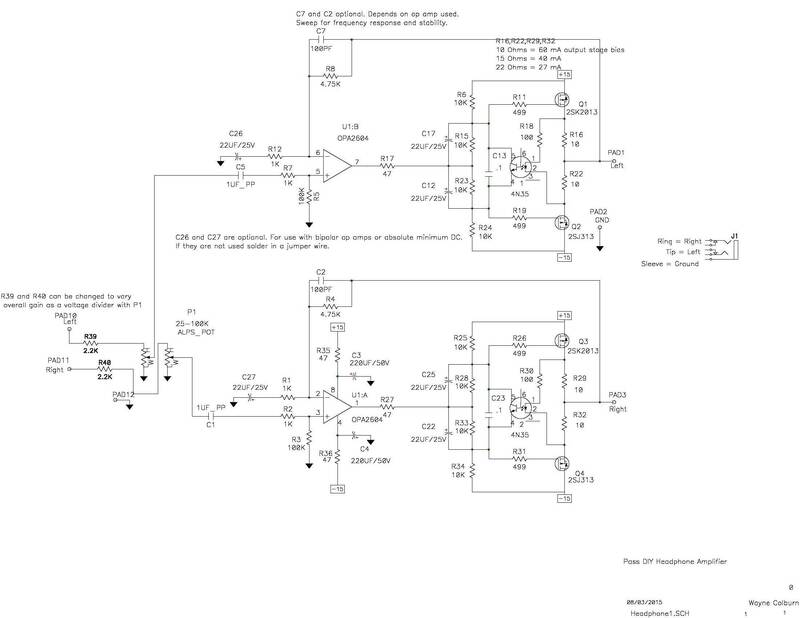 After the opamp there is a Mosfet source follower for current capibility, and the feedback loop includeds the opamp. 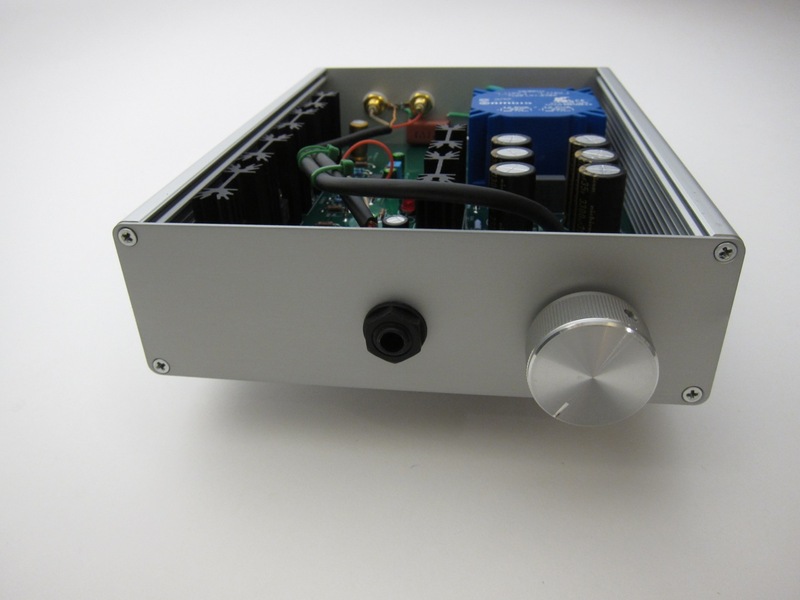 This keeps the DC offset stable as well as lowers the output impedance to a very low level, less than 1/10 of an ohm. 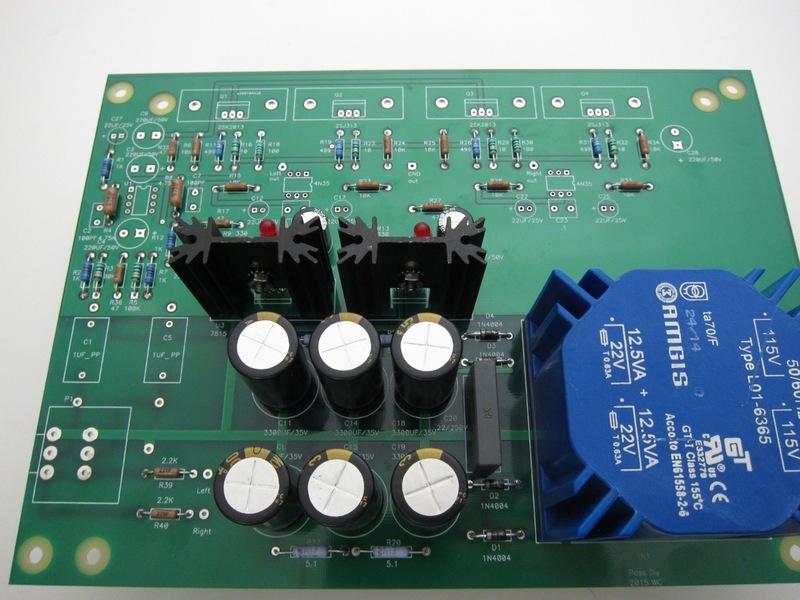 The output stage is a Mosfet NP pair in source-follower configuration. Being a follower it can add no voltage to the signal but can contribute lots of current. Since the opamp os being used for gain this is not problem. It also has the advantage of adding very little sonic flavor to the signal, it's esentally transparent. 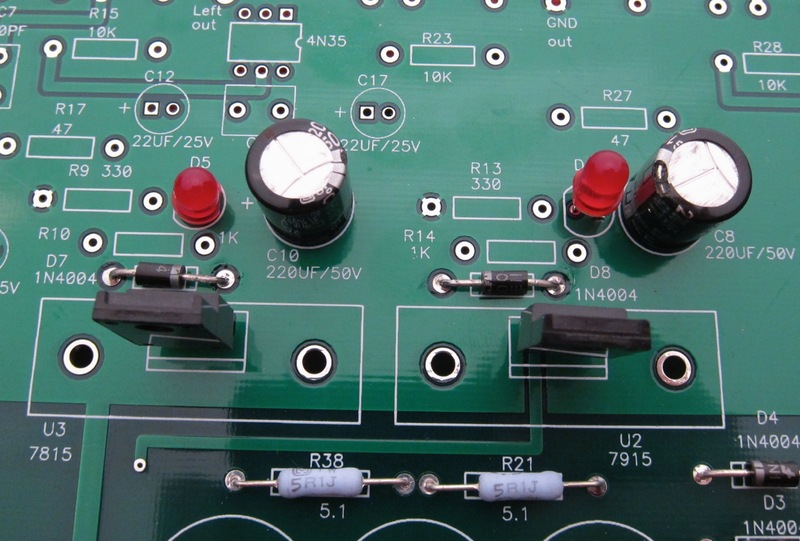 The output stage is simple, powerful, will drive anything, and is self adjusting due to optocoupler and the opamp controls DC offset because the output stage is in the feedback loop. No potentiometers to adjust or voltages to read when biasing. 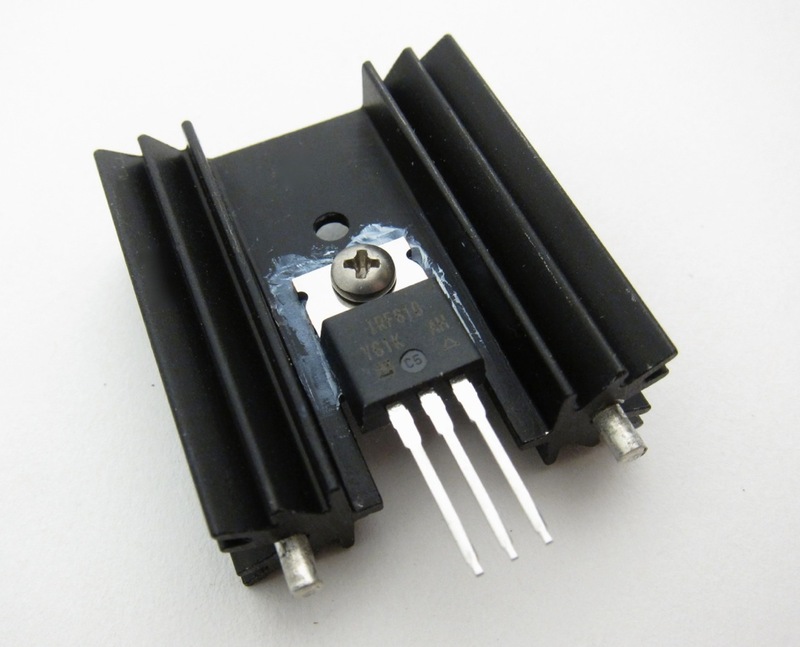 The following Mosfets work well in the circuit. (4) 10K resistors make a voltage divider to give lots of bias voltage to the gates; this bias will be 1/2 the rail voltage. Assuming a standard build with 17v rails this will give the Mosfets a maximum of 8.5v of bias. With no other controls his would make the output devices conduct like there’s no tomorrow, and probably let the smoke out, but the 4N35 optocoupler helps control and set the necessary bias voltage. With this it happily operates in Class-A all the time. The optocoupler has two sides when looking at the schematic, the diode and the transistor. They are linked optically, not electrically, so the two sides of the optocoupler can share different voltages that don't effect the other side. as the current change in the LED side of the opto it will glow brighter or dimmer, which controls how much the transistor side conducts - in this circuit the current through the LED is directly equal to the mosfet current, and as it gets brighter it controls the BJT, whereby the BJT "burns up" the excess dc bias voltage. The optocoupler appears to be a variable resistor in parallel with the inside 10k resistors - it changes the gate bias with the collector-emitter junction as the opto coupler looks at the current through the mosfet sources. The LED part of the opto has a 1.2v constant drop, this is used in conjunction with R18 to set bias current across the source resistors. If the current is too high it will make the LED brighter, that modulates the base of the transistor, and the collector-emitter junction will decrease its apparent resistance in parallel with the inside 10k resistors, changing the ratio of rail voltage to ground, decreasing the amount of voltage on the gates, and keeping the bias stable as the load swings. 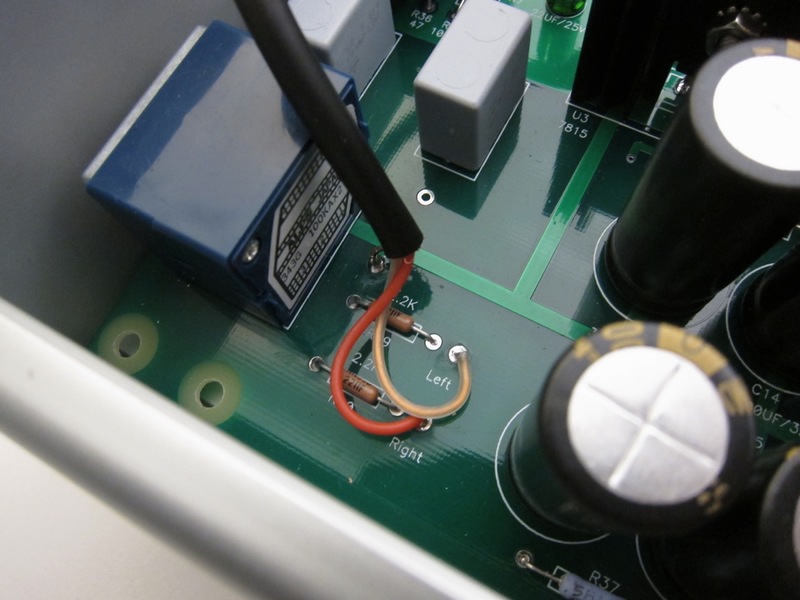 The diode in the 4N35 gives voltage across source resistors to set current, a 1.2V reference. Last edited by 6L6; 15th April 2018 at 02:45 PM. How to use this guide - READ THE CAPTIONS BELOW EACH PHOTO! That’s where the good info is. Also you can click on any photo to view in full size. The PCB. 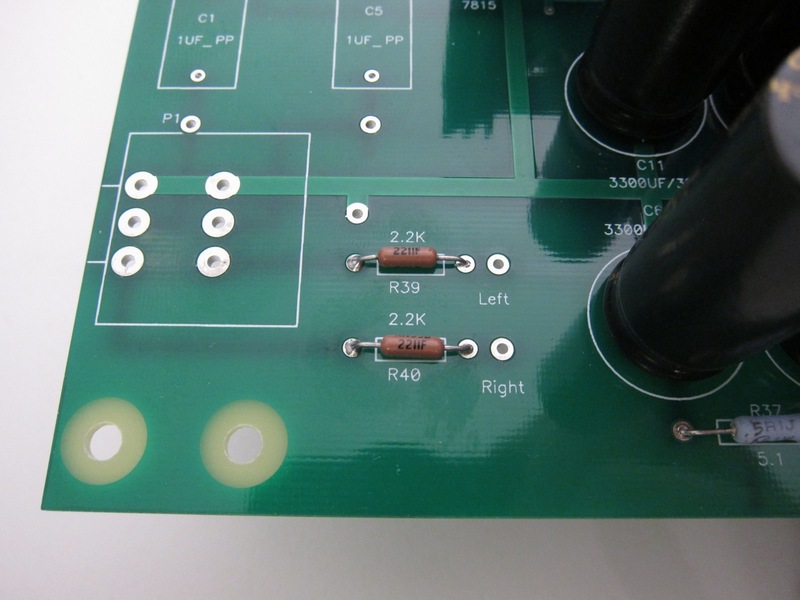 This is a rev.3, the latest version, identifiable by the pads near the pot for the 2.2k resistors. 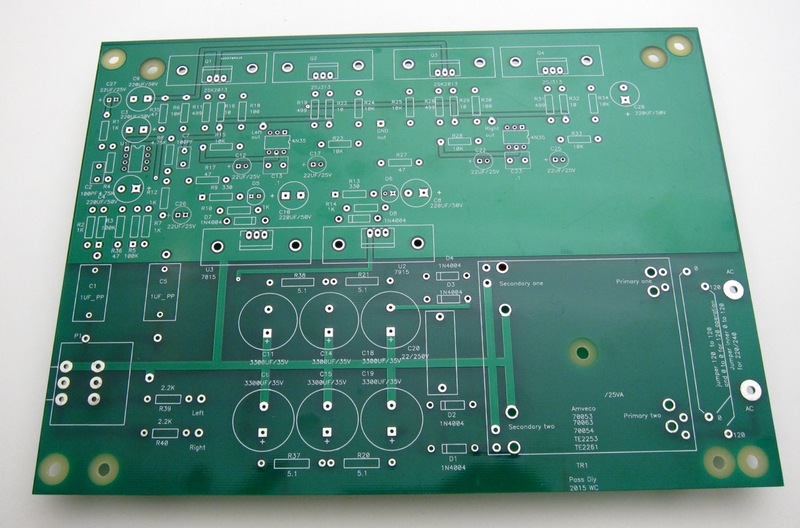 Production versions in the diyAudio store may be very slightly different, with slightly different silkscreen and probably in a different color. The transformer have dual primaries and can be used for 120VAC or 240VAC mains. 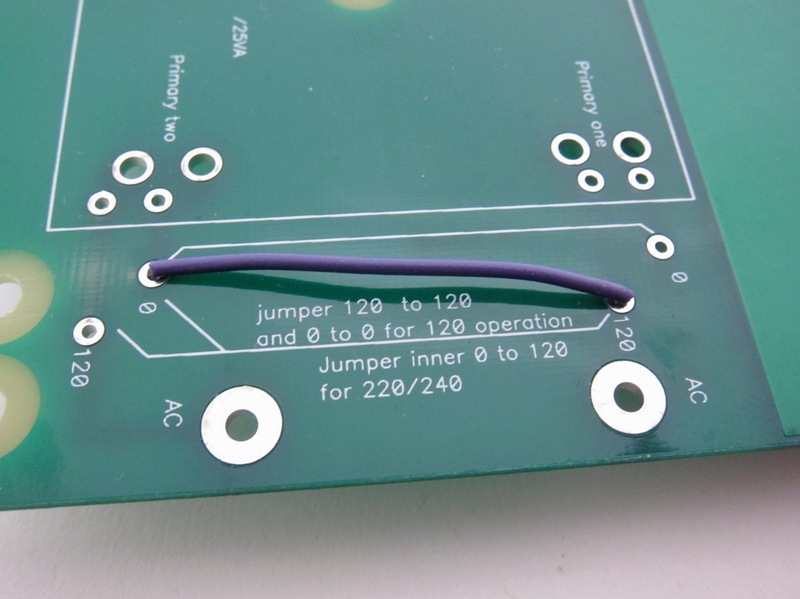 There is room for jumpers on the PCB and they must be connected properly depending on your mains voltage. 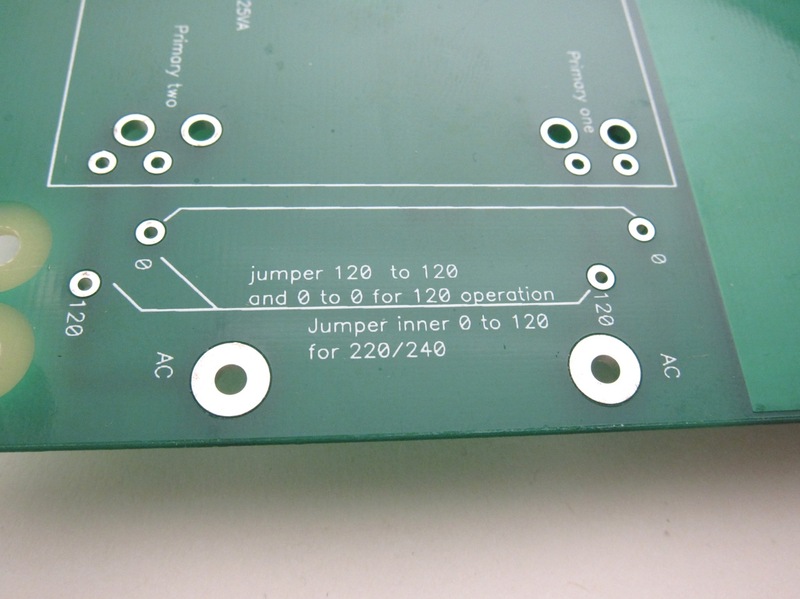 Instructions for the jumpers are written plainly on the PCB. With the Hammond enclosure you can see that things get pretty tight. I used a small IEC inlet with integral fuse. Note that the AC Live should be the lead that is fused, and some IEC sockets have fuses on the Live and Neutral, check with your country’s codes to see if having Neutral fused is acceptable. Live should go to the lead winding of the primary which is the AC pad towards the middle of the PCB, and the Neutral to the trailing lead, the AC pad closer to the corner. Safety earth is attached to the chassis via a screw and a star washer. If you add a power switch, switch the Live lead. Using a slightly longer enclosure greatly simplifies this. Also, my layout isn’t ideal — I’d suggest placing the IEC closer to the center of the back panel to it’s not smashed against the transformer. You can (sort of) see the screw and star washer used for safety earth in this photo. The orange capacitor is attached to safety earth on one side and the ground tabs of the RCA jacks on the other. The RCA jacks are isolated from the chassis with their shoulder washers. 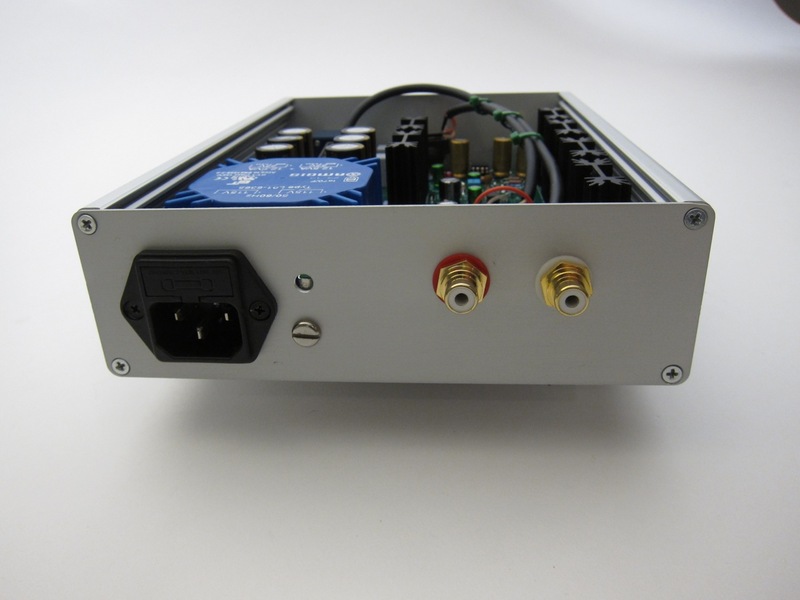 Making sure the PSU is behaving properly first is an integral part of a successful build. So it will be populated first. 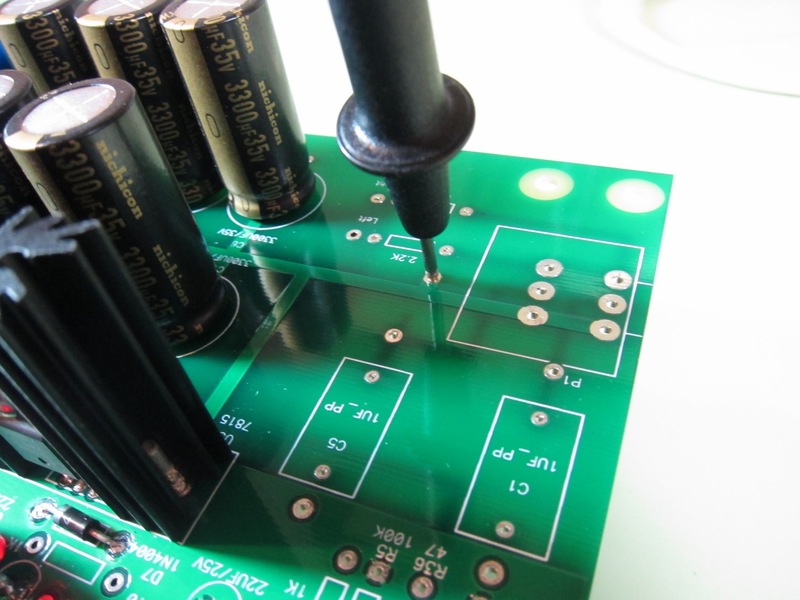 Print out the Schematic and have it in front of you at all times when soldering. 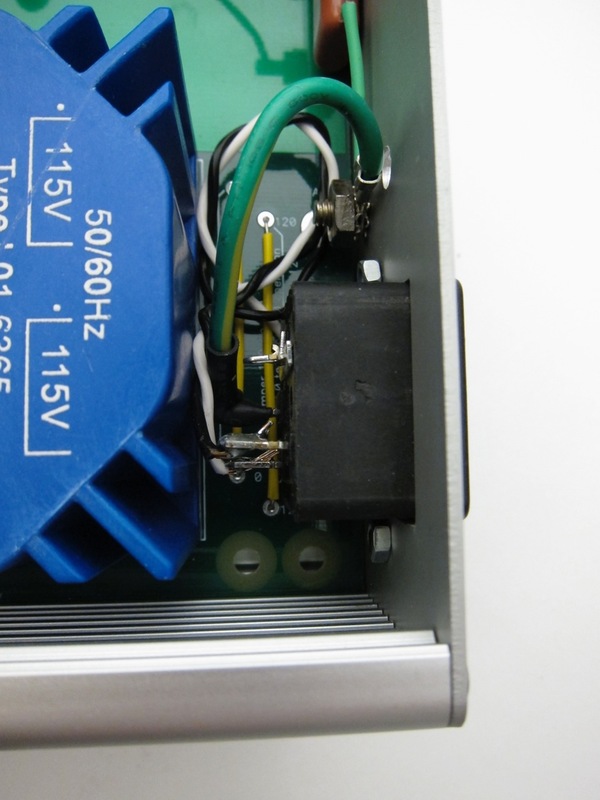 This PSU requires some choices to be made, so DO NOT populate everything on the schematic. It will not work properly if you do. More about this in a few steps. 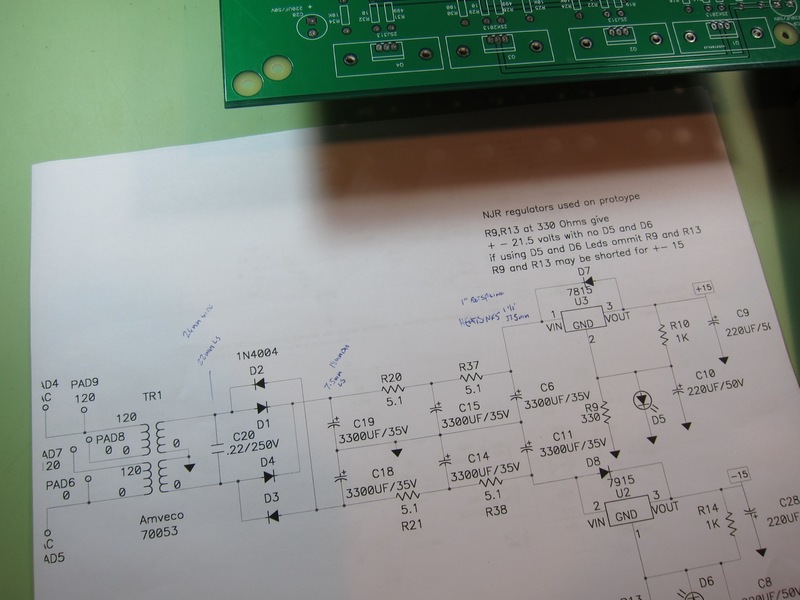 When working on any part of this project, print out the schematic and have it in front of you at all times. 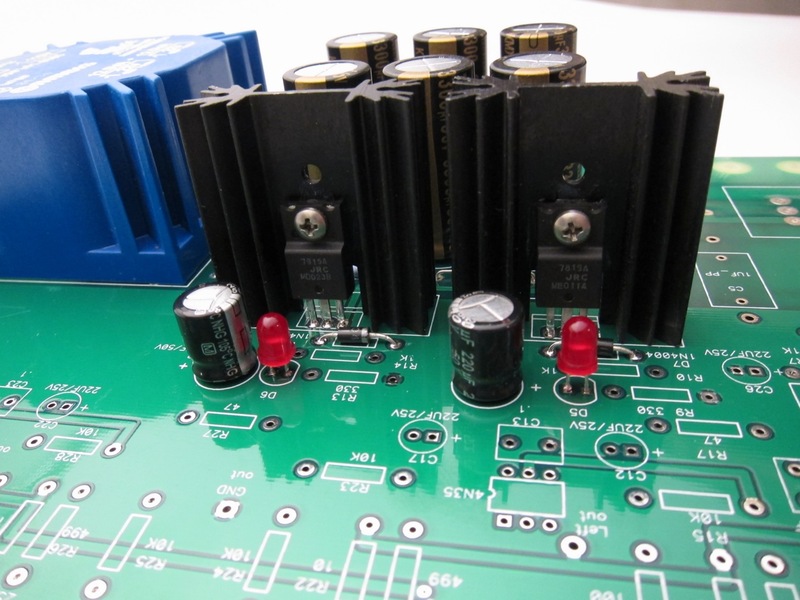 Start with the passive filtering - the rectifier diodes, the filter resistors, the grey snubber capacitor, and the tall filter capacitors. Note that the big caps are polarized, and need to be on the PCB in the right direction or they will blow up. 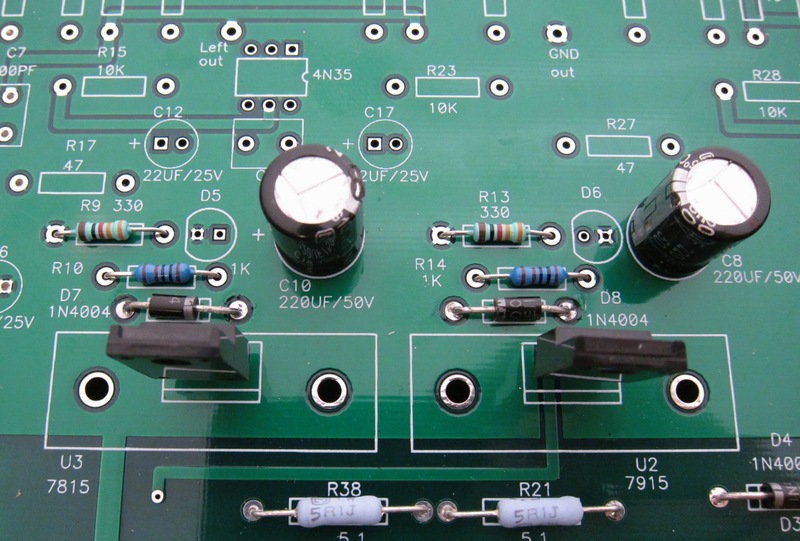 The + is noted on the PCB, and the + also has a square pad. 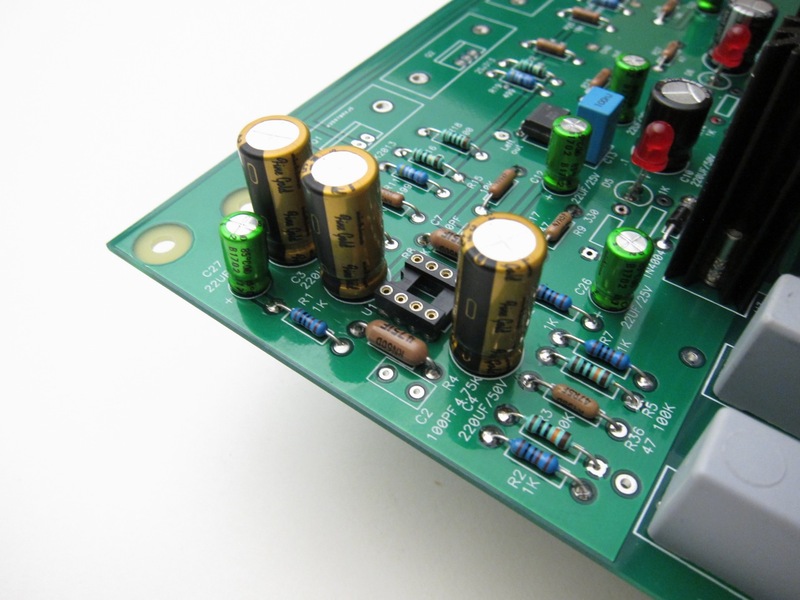 + is indicated on the capacitor by the long lead, and also - is shown on the cap’s insulation. At this time also stuff D7 and D8, they are protection diodes for the regulators and will be used in all configurations. 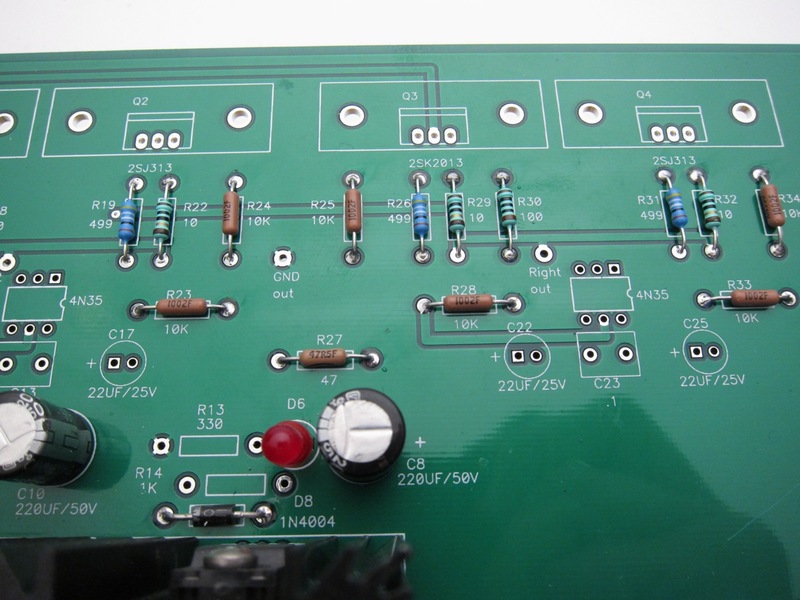 The PCB has the ability to be wired to use the regulators in their most simple mode, to have a LED voltage reference added, or to have the voltage set by using a resistor voltage divider. 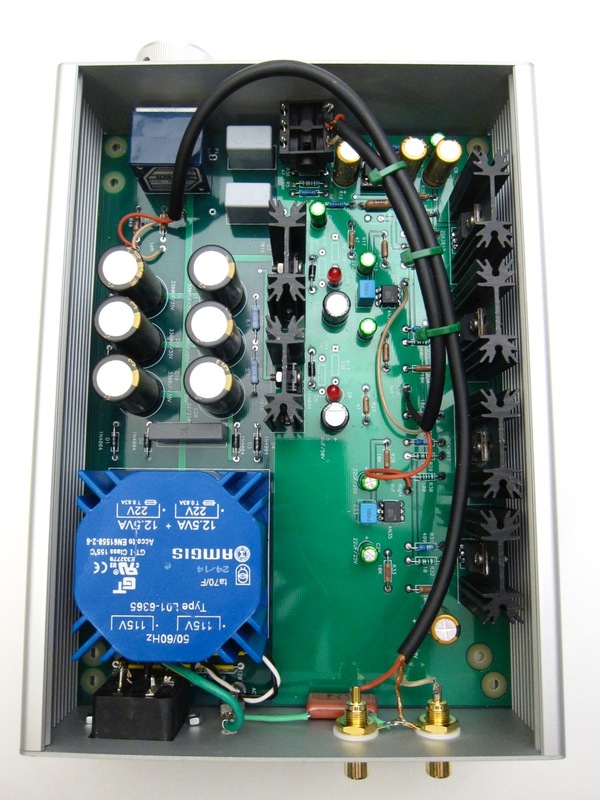 This is to give builders a chance to use many different configurations to suit what parts and transformers that may have. All configurations work beautifully and are very quiet. 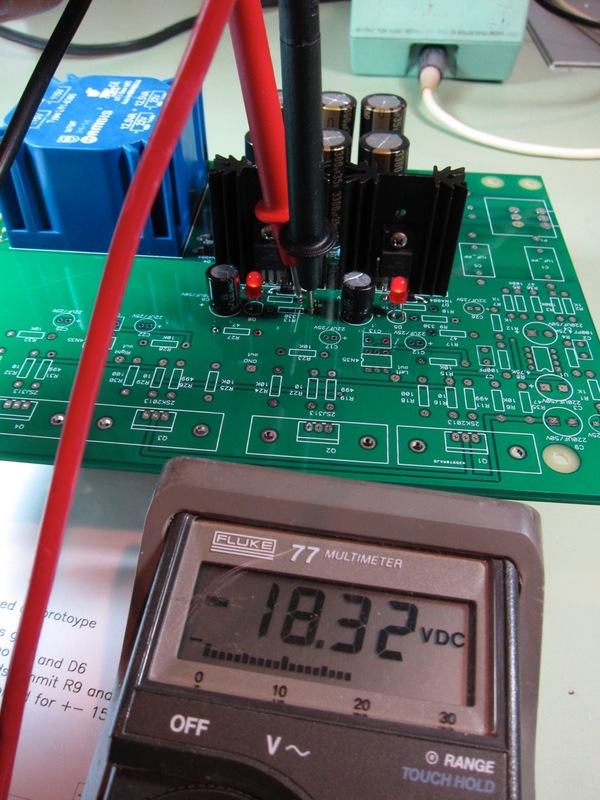 I suggest that you build it with the LED voltage reference, and the bulk of the photos in the guide will show this. 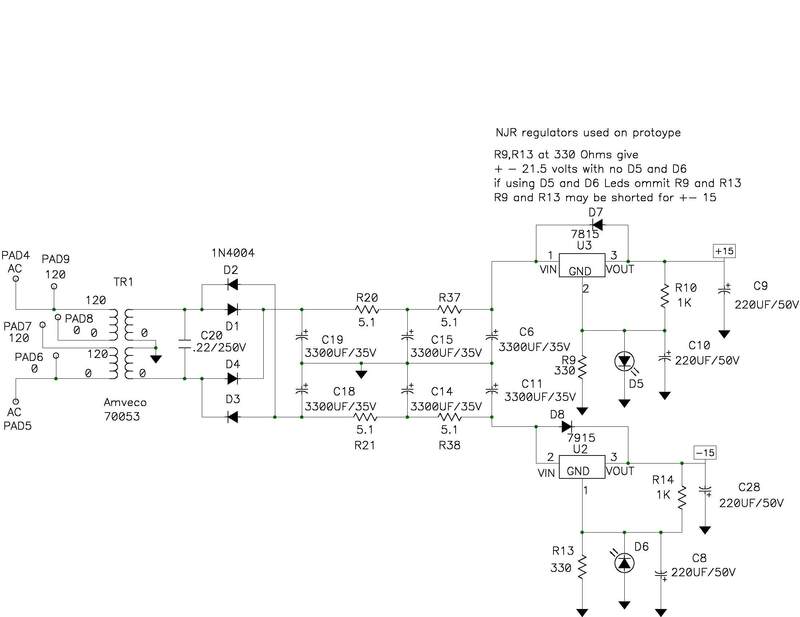 This is the simplest configuration, it uses the 78xx and 79xx regulators in their most simple configuration. R9 and R13 are jumpered in order for the regulators to see ground and nothing else is added. Also note that the flat of the regulator is facing the line on the silkscreen. they are shown here for illustration. Heatsinks will be added to the regulators, do not run these without heatsinks. If you don’t have a specific other reason to do so, build this configuration. This is the quietist configuration of the three, though not by all that much. 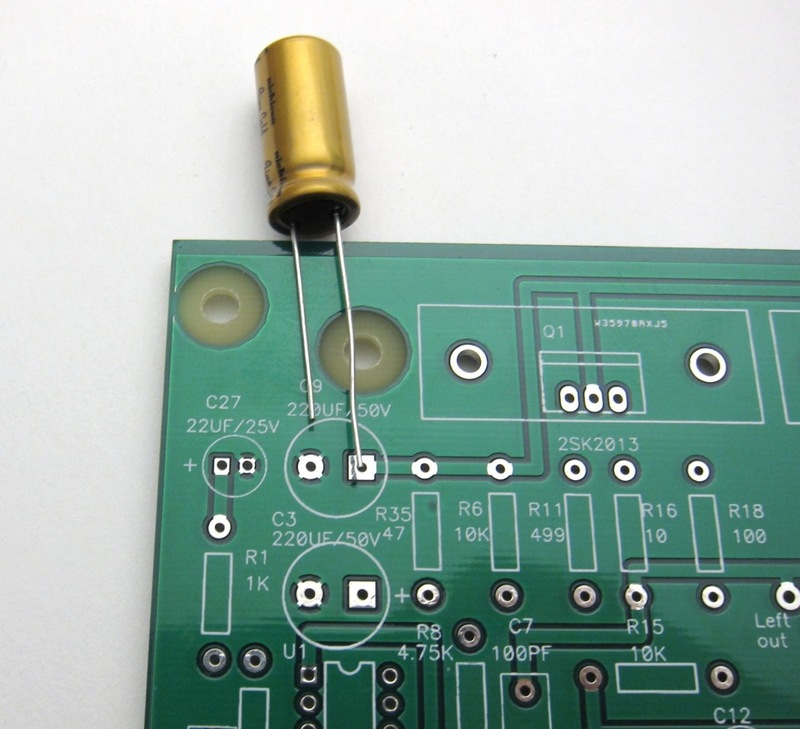 The LED is used to elevate the regulator off ground by it’s V fwd, and the cap is used to control the impedance of the diode at high frequency, making the whole circuit quieter. Use a red LED to raise the voltage by about 1.8v more than the regulator, use orange, green or yellow for a few more tenths of a volt. 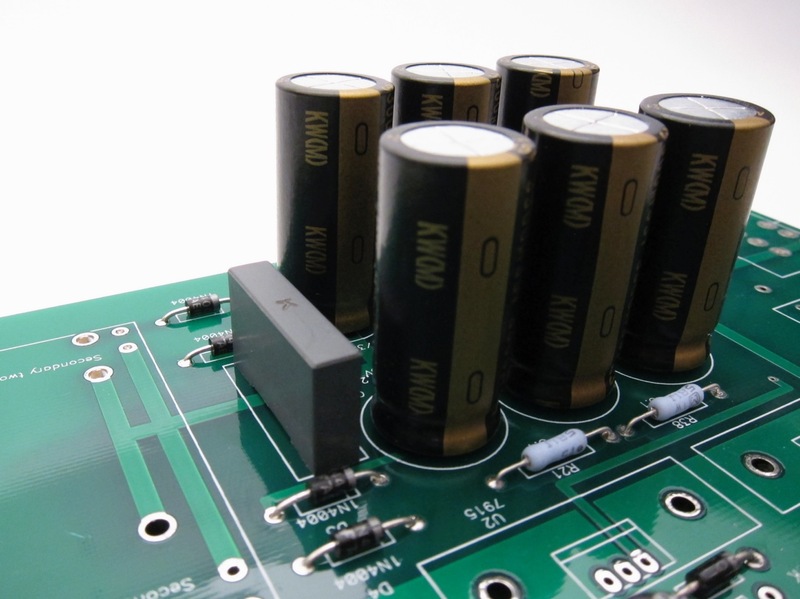 Do not use blue or white, they are 3.3v and very noisy when used as a voltage reference. Using resistors at positions R9,10 and R13, 14 and the capacitor, will set up a voltage divider across the reg setting the output voltage at 21.5 when using the suggested values. Attach the transformer and the regulators + heatsinks. 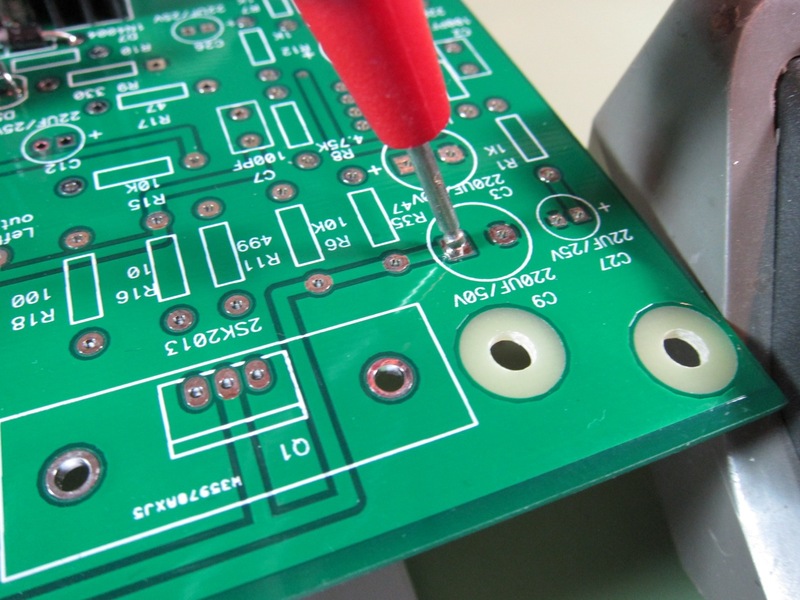 See below for notes on thermal grease, heatsinks and screws. Plug in the transformer and power it on. The LEDs should light. 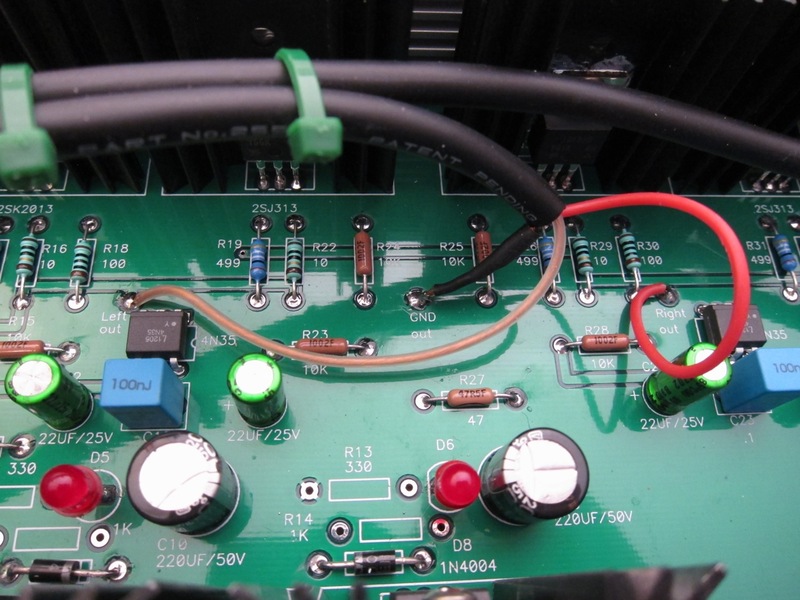 Place your meter to DC volts and measure the V+ rail between the ground pad near the pot and the square pad of capacitor C9. (Or both pads of C9, red on square and black on the round) This should read approximately +17V give or take a volt. Measure V- with the black probe on R13 pad and red on the R14 pads as shown. Read -17V plus or minus a volt or two. Why are the voltages not precise? Because there is no load on the regulators at all, and they have no current flowing through them to regulate. This is normal with the rest of the board unstuffed. 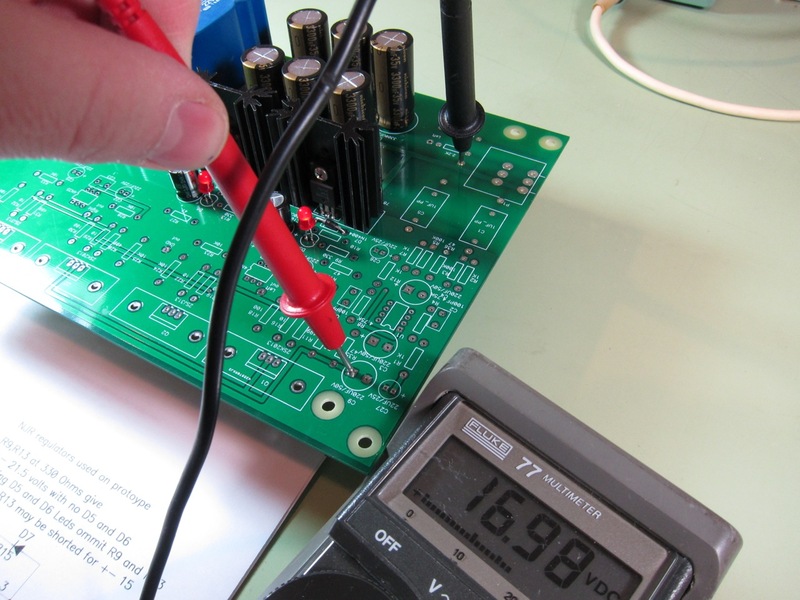 If the voltages measure good and there’s no smoke or shorts, move on to the next step! Last edited by 6L6; 22nd January 2018 at 07:43 PM. Although somewhat invalidated by the PSU being complete, the old advice of stuffing the smallest to the biggest components holds true. Start with the resistors. 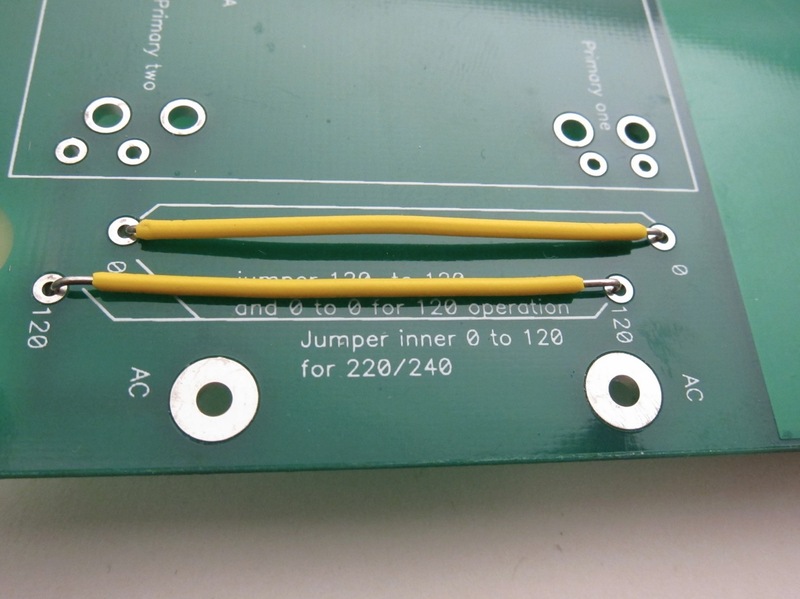 Resistors - All resistors have 0.5” lead spacing. 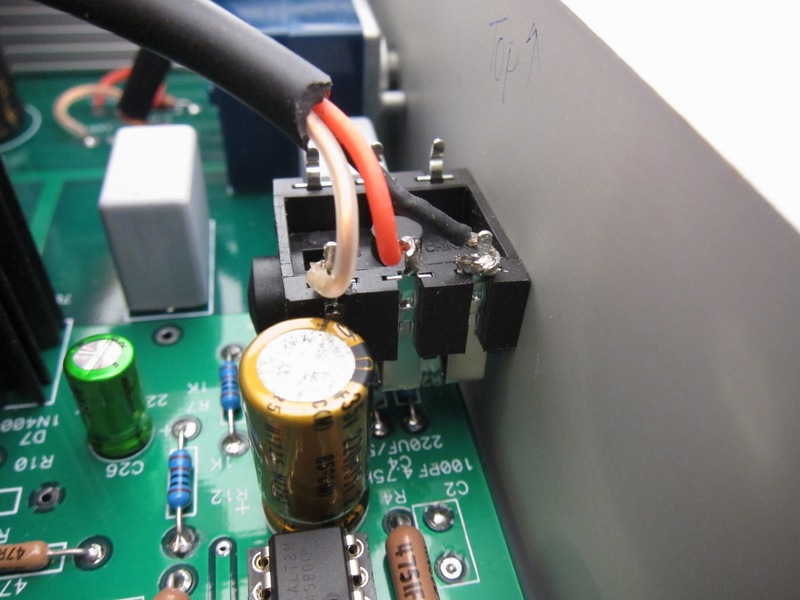 Remember that when using polarized capacitors to put the long lead (+) into the square pad. The dot on the body of the Optocoupler is placed on the same side as the notch in the drawing on the silkscreen. The dot on the body of the opamp is placed on the same side as the notch in the drawing on the silkscreen. The dot should be closer to the pair of 220uF capacitors. 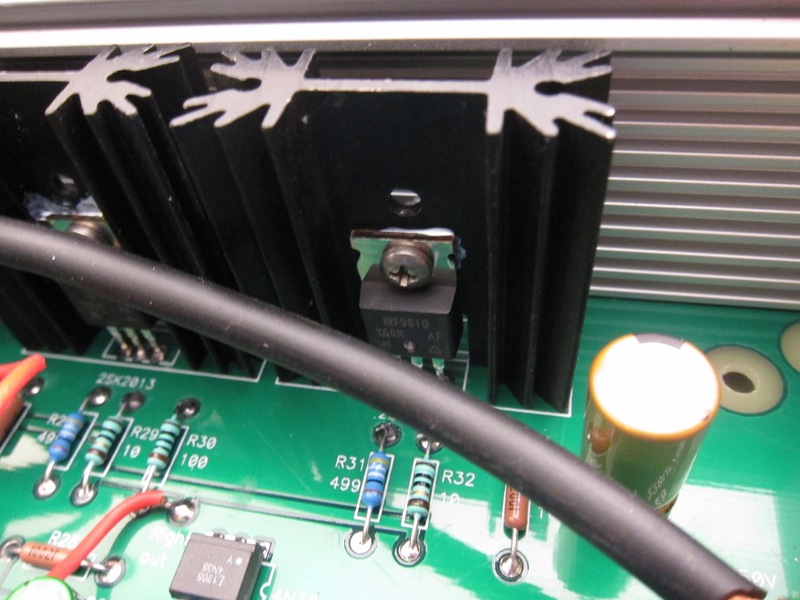 The heatsinks are not attached electrically to the PCB, you do not need to use insulators if your TO-220 devices have metal tabs. A bit of thermal grease is extremely helpful. Align the device to he heatsink and snug on the screw, bit do not make it tight yet. The procedure is the same for the regulators. I used shielded mic cable in this build. Other wire will work, use what you have on hand. Input at PCB. In this photo the ground wire is mostly hidden by the jacketed cable. Use this photo as an example of what NOT to do -- please move the IEC inlet to the middle of the back panel to get it away from the transformer. Last edited by 6L6; 14th March 2018 at 02:05 AM. Ripple after 3rd caps, before the regulators. The lesson here? The “big and simple” approach of noise filtering using multiple CRC is extremely effective. Distortion residual from AP, this is mainly 2nd harmonic, and overall very low. Square wave response. Clean, no ringing, very, very small shoulder at the leading edge. Last edited by 6L6; 12th April 2018 at 02:40 PM. Here's a rough (but useful) list with some important annotations. 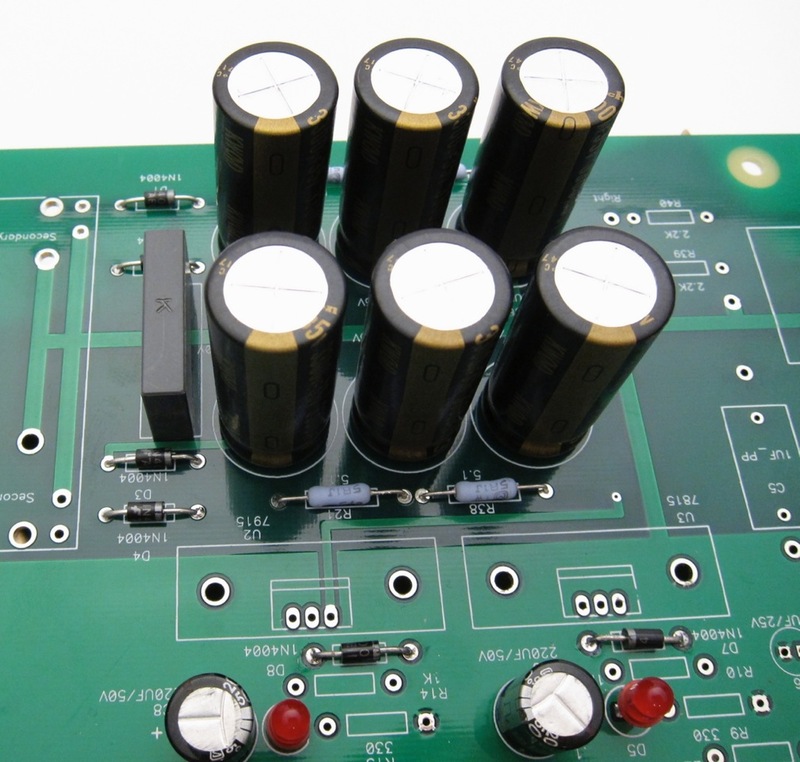 They are of fantastic precision, sound great, and the value is written clearly on the body of the resistor. They are far and wide my favorite resistor. Last edited by 6L6; 26th September 2018 at 06:36 PM. Last edited by 6L6; 12th March 2018 at 07:27 PM. Great build Guide as always!! I would suggest that you insert an information regarding grounding the potentiometer. 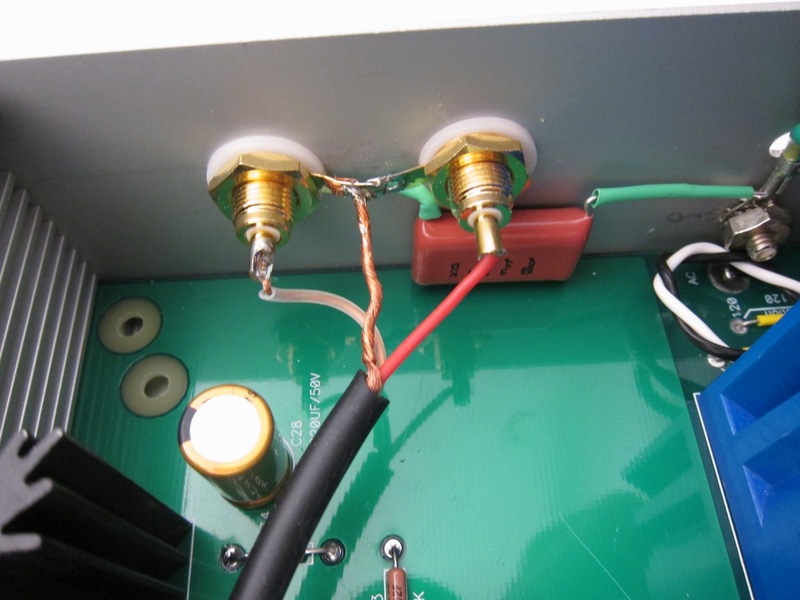 In some cases you can get hum noise on the output and grounding the potentiometer with a piece of wire running from one of the pot chassis screws to signal ground.